Sample frame from pg 11, sec. frame from the top (without indies). 1 pict: pg 28. a-Richard Corben. Color. 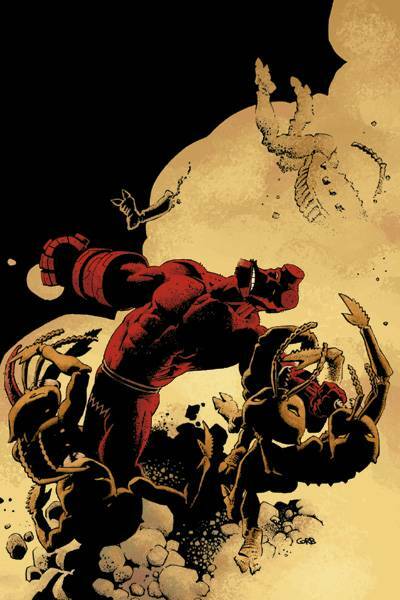 Truncate frame from front cover of Hellboy: Makoma#2 (2006). Pgs 27-28: Hellmail. Short thanks to comic-book hero Mr. Corben from Mike Mignola and editor Scott Allie in the beginning. 24 pgs: pgs 3-26. s-Mike Mignola. a-Mike Mignola & Richard Corben (pgs 8-24 of the story). c-Dave Stewart. l-Clem Robins. Color. Reprinted in Hellboy Vol. 7: The Troll Witch and Others [TB] (2007), Hellboy [Library Edition] Vol. 4 (2013), and Hellboy: The Complete Short Stories Vol. 2 [TB] (2018). “Hellboy: Makoma #2” [PICT]Front Cover Art -Richard Corben. c-Dave Stewart. Color. Mike Mignola’s Hellboy™ ©  Michael Mignola. All rights reserved. Published by Dark Horse Comics, Inc. Used with permission. are registered trademarks of Dark Horse Comics, Inc. The very same frame as in #1! 24 pgs: pgs 3-26. s-Mike Mignola. a-Mike Mignola & Richard Corben (pgs 1-21 of the story). c-Dave Stewart. Color.